Mayo is one of the most famous condiments in America. It’s one of the key ingredients used in a variety of dishes, like deviled eggs and chicken salad. Every restaurant knows mayonnaise is a must-have and to get it from Round Eye Supply for the best bulk mayonnaise prices. As a leader in wholesale mayonnaise distribution, Round Eye Supply offers real mayonnaise from Kraft in 15 oz jars packed 12 per case, 32 oz pouches packed 16 per case, and 1 gal jars packed 4 per case. We carry squeezable containers from Hellmann’s and single-serve mayo dressing packets. You’ll also find heart-smart choices like fat-free, light and whipped mayo. Light mayo packets are also available in flavors, such as chipotle, garlic herb, and horseradish dijon. Our artisanal mayo brands, such as Sir Kensington’s and Smart Balance, are known for enhancing mayonnaise with high-quality ingredients. Sir Kensington's makes a French-style mayo using free-range eggs and sunflower oil. Smart Balance enriches its light mayo with omega fatty acids and only uses non-GMO oils. Round Eye Supply also carries the rare and illustrious Japanese mayo, Kewpie, in 17.64 oz containers packed in a case of 20. This salty mayo is a staple for any Asian restaurant serving anything from sushi to Vietnamese street food. Find the best mayo for your restaurant today from Round Eye Supply and save more! Mayo, Dressings and Condiments Gold Medal Heavy Duty 30 Lb. Tub Mayonnaise 4 Gal. Mayo, Dressings and Condiments Heavy Duty Gold Medal Mayonnaise 1 Gal. Dukes Whipped Salad Dressing - 12 Grm. Heinz Mayonnaise Dispenser Pack - 1.5 Gal. Heinz Mayonnaise Roomservice - 1.8 Oz. Heinz Mayonnaise Single Serve - 12 Grm. 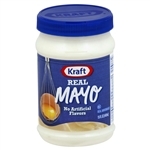 Kraft Real Mayonnaise - 15 Oz. Kraft Squeeze Real Spoonable Mayonnaise - 12 Oz. Kraft Miracle Whip Squeeze Spoonable Mayonnaise - 12 Oz. 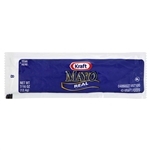 Kraft Real Mayonnaise Pouch - 32 Oz. Kraft Extra Heavy Mayonnaise Carton - 480 Oz. Kraft Extra Heavy Mayonnaise - 30 Lb. Kraft Extra Heavy Mayonnaise - 1 Gal. Kraft Mayonnaise Dressing Spoonable Fat Free - 0.44 Oz. Kraft Fat Free Mayonnaise Dressing - 1 Gal. Kraft Light Mayonnaise - 1 Gal. Kraft Light Squeeze Mayonnaise - 0.44 Oz. Kraft Real Mayonnaise - 1 Gal. Kraft Real Pail Mayonnaise - 30 Lb. Kraft Mayonnaise Squeeze - 0.44 Oz. Kraft Squeeze Mayonnaise - 0.44 Oz. Kraft Extra Heavy Mayonnaise - 32 Oz. Portion Pac Mayonnaise - 12 Grm. Portion Pac Mayonnaise - 9 Grm. Portion Pac Mayonnaise 12 Grm. Portion Pac Americana Mayonnaise - 12 Grm. Portion Pac Americana Mayonnaise Polypropylene - 9 Grm. Unilever Best Foods Hellmans Mayonnaise - 4 Gal. Unilever Best Foods Hellmans Plastic Extra Heavy Mayonnaise 1 Gal. Unilever Best Foods Hellmans Mayonnaise Individually In Jar 1.2 Oz. Unilever Best Foods Hellmans Light Mayonnaise - 1 Gal. Unilever Best Foods Hellmans Mayonnaise Plastic Bottle - 1 Gal. Unilever Best Foods Hellmanns Packed In Plastic Mayonnaise - 15 oz. Unilever Best Foods Hellmanns Retail Mayonnaise - 8 oz. Unilever Best Foods Hellmanns Retail Mayonnaise - 30 oz. 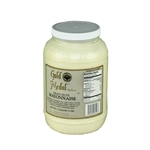 Ventura Foods Classic Gourmet Deluxe Mayonnaise - 1 Gal. Dukes Light Mayonnaise - 12 Gm. Dukes Mayonnaise Squeeze Bottle - 18 Oz. Dukes Heavy Duty Mayonnaise - 1 Gal. Sauers Mayonnaise Pouch - 12 Gm. Sauers Mayonnaise Pouch - 9 Gm. Extra Heavy Duty Mayonnaise - 1 Gal. Hellmanns Best Foods Real Mayonnaise Pouch - 24 Oz. Dukes Regular Mayonnaise - 12 Grm. Dukes Mayonnaise Pet - 128 Fl. Oz. Extra Heavy Duty Mayonnaise White River - 1 Gal. Blue Plate Heavy Duty Mayonnaise Plastic Jug - 1 Gal. JFG Heavy Duty Mayonnaise Plastic Jug - 1 Gal. Mayonnaise Olive Oil - 16 Oz. Mayonnaise With Olive Oil One Gallon - 128 Oz. Mayonnaise Signature Kraft - 1 Gal. Fat Free Mayonnaise - 12 Grm. Superior Bonne Chere Extra Heavy Mayonnaise - 1 Gal. Mayonnaise Light Chipotle Flavor - 12 Grm. Condiment Light Mayonnaise - 12 Grm. Real Mayonnaise Portion Control Stick - 0.38 Oz. Mayonnaise Vol Pak - 3 Gal. Hellman's Mayonnaise Light Packets - 0.38 oz. Hellmanns Real Mayonnaise Squeeze - 11.5 Oz. Flavor Fresh Mayonnaise Pouch - 9 Gr. Flavor Fresh Light Mayonnaise Pouch - 12 Gr. Flavor Fresh Mayonnaise Pouch - 12 Gr. Hellmanns Real Mayonnaise-Squeeze Bottles - 12 Oz. Hellmanns Real Mayonnaise-Squeeze Bottles - 11.5 Oz. All Natural Mayonnaise - 30 Lb. Simply Heinz Mayonnaise - 12 Gr. Dukes Mayonnaise - 32 Fl. Oz. Cains Mayonnaise - 1 Gal. Mayonnaise Extra Heavy Duty No Trans Jar - 1 Gal. Hellmann's Mayonnaise Cap Down Creamy Dijonnaise Mustard - 12.25 Oz. Mayonnaise is a food that adds taste to whatever it touches including chicken salad, hamburgers, remolade sauce and more.